There are 25 Assisted Living Facilities in the Springville area, with 3 in Springville and 22 nearby. To help you with your search, browse the 119 reviews below for assisted living facilities in Springville. On average, consumers rate assisted living in Springville 4.5 out of 5 stars. Better rated regions include Mapleton with an average rating of 4.8 out of 5 stars. Caring.com has helped thousands of families find high-quality senior care. To speak with one of our Family Advisors about assisted living options and costs in Springville, call (855) 863-8283. Located less than an hour to the southeast of Salt Lake City, Springville offers a quieter, artsier lifestyle for commuters and seniors seeking a more laidback environment with access to big-city amenities. Springville’s seniors have plenty of choices when it comes to assisted living: There are 29 communities in and around Springfield, all of which operate under the auspices of the Utah Department of Health. Housing prices in Springville are well above the national average, but lower-cost groceries, health care and utilities help keep Springfield’s cost of living within the realm of affordability for budget-minded seniors. Dry, hot summers are the norm in Springville, but the weather gets slightly less comfortable in winter when temperatures drop to 19 degrees Fahrenheit in January and snowfall reaches an average of 55 inches annually – more than double the national average. Low crime rates in both the violent crime and property crime categories help make Springville a safe option for seniors concerned about personal security. Springville is known as “Utah’s Art City,” and it lives up to its nickname with a full roster of cultural events that includes a Sunday concert series, commissioned statues placed throughout the city, numerous festivals, an art museum and access to concert venues like Gezzo Hall and Velour Live Music Gallery, both in nearby Provo. The Springville area is home to world-class medical facilities, including Utah State Hospital and Mountain View Hospital, in the event of medical emergencies or illness. Springville has an array of community resources for seniors, including the Utah Department of Human Services Aging and Adult Services, which offers help with long-term care, transportation, home and community-based services and food and nutrition for seniors across the state, as well as at least one senior center. Assisted Living costs in Springville start around $0 per month on average, while the nationwide average cost of assisted living is $4,000 per month, according to the latest figures from Genworth’s Cost of Care Survey. It’s important to note that assisted living rates in Springville and the surrounding suburbs can vary widely based on factors such as location, the level of care needed, apartment size and the types of amenities offered at each community. Utah offers just two options for low-income seniors looking for help locating and paying for long-term care in Springville. 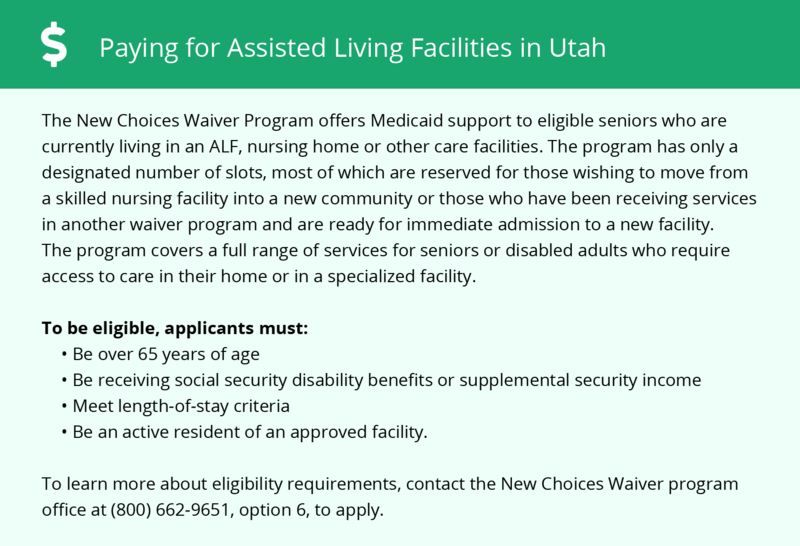 The Utah Home and Community Based Services (HCBS) Waiver gives seniors an opportunity to explore a range of home and community-based services so that individuals who prefer to avoid nursing home placement may do so. 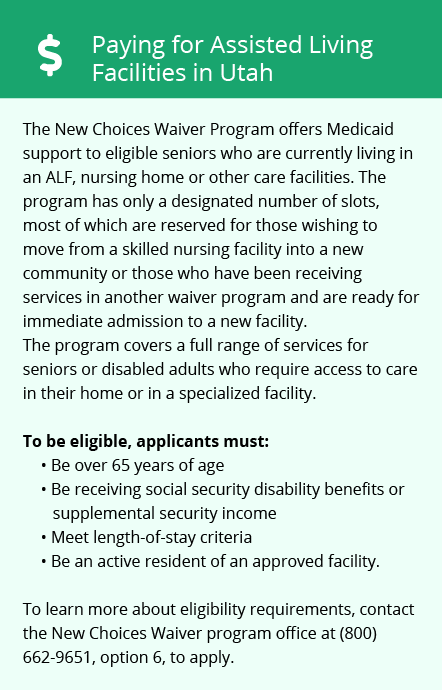 The New Choices Waiver shares that same commitment to seniors’ freedom of choice with an additional focus on helping those seniors already in institutionalized care transition back into home care or an assisted living facility. Springville and the surrounding area are home to numerous government agencies and non-profit organizations offering help for seniors searching for or currently residing in an assisted living community. These organizations can also provide assistance in a number of other eldercare services such as geriatric care management, elder law advice, estate planning, finding home care and health and wellness programs. To see a list of free assisted living resources in Springville, please visit our Assisted Living in Utah page. Springville-area assisted living communities must adhere to the comprehensive set of state laws and regulations that all assisted living communities in Utah are required to follow. Visit our Assisted Living in Utah page for more information about these laws.